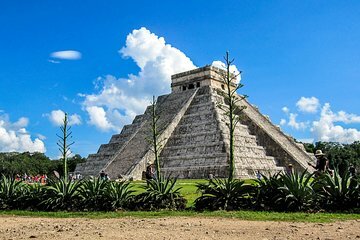 Take a day trip to Chichen Itza with a few fun side excursions. After pickup from your hotel, drive to a sacred cenote in the city of Valladolid. After a refreshing swim, enjoy a a buffet lunch before embarking on your tour of Chichen Itza. One of the New 7 Wonders of the World, the pyramid complex was an epicenter of ancient Mayan life. A certified guide leads the tour, explaining the significance of the site along the way. A buffet lunch and entrance fees are included.